Despite being regarded by some as the second most important commodity behind oil, the iron ore market garners relatively little attention. Yet, until very recently, the market for iron ore was extremely opaque. For decades annual pricing contracts were hashed out in closed-door negotiations between major producers and steelmakers. Things began to change post-2000, however, led by rapidly growing demand for iron ore to feed steel mills in China. The country's years of infrastructure investment had resulted in persistent and soaring demand for steel. Between 2000 and 2014, global steel production almost doubled to 1.4 kilotonnes, fueling demand for iron ore. Reflecting the evolving dynamics of this commodity trade, in 2008 the world's largest iron ore producer Vale ordered the design and production of 19 new bulk ore carriers that would be bigger than any other previously constructed. Another 16 Valemax ships — as they would be known — were chartered to the company. Each ship has a capacity of 380,000 to 4000,000 tons of ore. 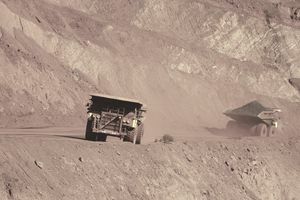 While demand in China soared, the new production was slow to come online and spot prices for iron ore, which had never exceeded $50 a tonne prior to 2008, soared as high as $190 per tonne in 2011. Highly dependent upon imported iron ore, Chinese steelmakers became concerned by the pricing power held by Rio Tinto, BHP and Vale — collectively known as The Big Three. In 2009 and 2010, Rio Tinto employees were arrested and jailed for stealing state secrets and accepting bribes from Chinese steel executives. China's dissatisfaction with the market power of The Big Three, along with increased price volatility, spurred the decline of negotiated annual contracts and the rise of electronic benchmark contract pricing for iron ore. In 2006, The Steel Index (TSI) was launched. TSI collects price data from companies in the steel, scrap, and iron ore supply chains to calculate a benchmark reference price for 58 to 65 percent iron ore fines delivered to ports in northern China. TSI's data is now utilized by exchanges in North America, Europe, India and Singapore who offer index-linked financial instruments for miners, mills, traders, distributors, processors, and customers. In 2009, the Big Three producers all separately announced that they would stop negotiating annual price contracts and sell ore based on independent benchmark prices. Since that time, the Big Three plus number four producer Fortescue Metals, who together account for over three-quarters of iron ore shipped each year, have invested more than US$ 100 billion to expand production. This, along with slowing demand from China, has led to a supply glut and spot prices significantly lower than the highs seen in 2011.